Oversized marble columns support the high lobby ceiling at 195 Broadway, former New York home of AT&T. 195 BROADWAY IN LOWER MANHATTAN is one of hundreds of buildings that might escape your notice upon your first walk through the city’s financial district. Less garish than its gothic neighbor, the Woolworth Building and a lot shorter than its big-shouldered brethren, the 29-floor landmark doesn’t shout for attention. Its true beauty emerges when you walk inside the somewhat restricted lobby, take the measure of the “bones” of its regal inner structure, and breathe in its storied history. Completed in 1916 after AT&T moved its American headquarters from Boston to New York, 195 was the strong, silent type of skyscraper….functional, neo-classic, but restrained, understated. As a largely urban photographer, I try to keep track of structures that have outlasted several uses and landlords, carrying their essence forward through decades of shifting styles and fashions. It’s the totality of what has made them last that makes them interesting to me, more than any single fillip or ornament. But ornament, as a visual metaphor for the new (20th) century of American technological dominance, was built into 195 Broadway from the start, both inside and out. Paul Manship, the sculptor whose public works, like the golden Prometheus statue at Rockefeller Plaza, still dot the Manhattan map, created one of his first major works, The Four Elements, as bronze relief’s on 195’s lower facades, his love of Greek and Roman mythology weaving itself into the Moderne movement (later re-dubbed as Art Deco). Architect William Bosworth took the Doric columns which usually adorned the outside approaches of other buildings and brought them into 195’s lobby, all 43 of them, their wondrous marble reflecting a variety of colors from the teeming parade of streetside traffic. 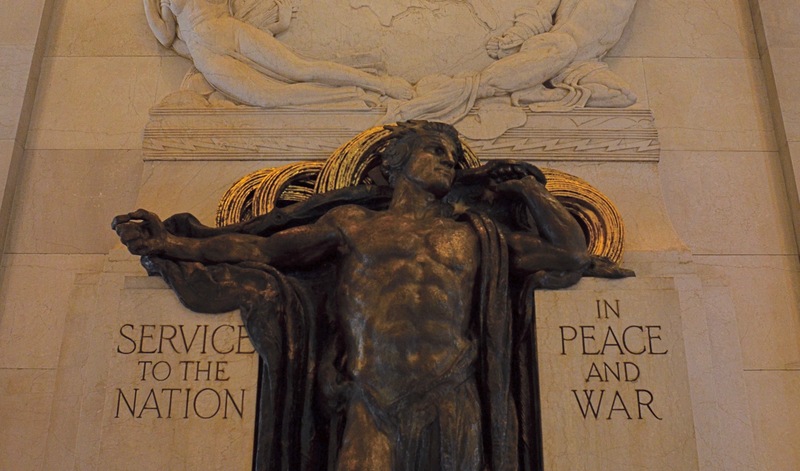 And sculptor Chester Beach used the same lobby to commemorate the building’s role as one half of the first transcontinental phone line in 1915 with Service To The Nation In Peace And War, a bronze relief of a headphone-wearing hero standing under a marble globe of the Earth, bookended by classic figures and flanked by lightning bolts. 195’s lobby marks the origination point of the first transcontinental telephone line. 195’s long run includes the titles like the Telephone Building, the Telegraph Building, the Western Union Building, as well as appearances in popular culture, like its portrayal of Charlie Sheen’s office building in Wall Street. Sadly, a few of its most salient features have moved on, like the gilded 24-foot tall winged male figure originally known as Genius Of Telegraphy, which topped the pyramidal roof of the tower on the west side of the building until 1980, when it followed AT&T’s relocation to Dallas, Texas. However, the remaining treasures of 195 Broadway are still a delight for both human and camera eyes. Good buildings often present their quietest faces to the street. But look beyond the skin of the survivors, and marvel at the solid bones beneath. This entry was posted on February 3, 2019 by Michael Perkins. It was filed under Art Deco, Design, History, Neighborhoods and was tagged with Architecture, Manhattan, Paul Manship. Another building to visit. Michael thank you. I find that every building has a distinct signature, and a visual story as well. Thanks as always, Tim. I’m particularly interested in those that can be photographed and will do well in black and white. If you have some suggestion, that would wonderful. Hopefully you taken note of some that I’ve already photographed. If there are duplicates that is fine.